I feel like I’ve swallowed something huge, and it’s not just the great German food. It’s going to take me a while to digest this experience of being with the European Airstreamers. So much is happening, and I’m learning so much that I can’t fathom it all at the end of each day. Today was again tremendously fun. We rolled out of bed at 8:30 rather sluggishly (at least me) since we went to bed far too late last night. Armin popped by with a tray of warm rolls and excellent coffee for Eleanor, which we added to the Muesli that I was eating, and some strawberries, and some cream cheese. 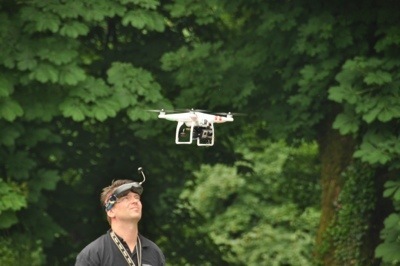 After breakfast I found Armin outside preparing his quadracopter for another aerial flight over the campground. The light wasn’t ideal, but he got some video anyway and no doubt he will try again. These videos will probably make it to YouTube in a few weeks. There was no program for the morning, which was ideal for casual conversation. The Europeans seem to enjoy taking breakfast outside, so just by walking down the row of Airstreams I was able to find several people to talk to. I dropped in on Ben and Denise, who were camping with their friend Marcus, and picked Ben’s brain about Switzerland. I left with a full page of suggestions and helpful advice, which I think will make that part of our trip very easy. Michael Hold dropped by for a chat, and then he grabbed my camera and got a rare shot of Eleanor and me together, which I think will become a cherished momento of this trip. 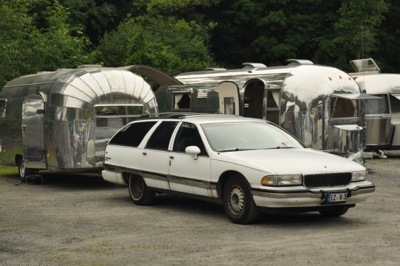 Then we hopped in the Citroen for a quick drive over to Airstream Germany’s showroom in nearby Merenburg. 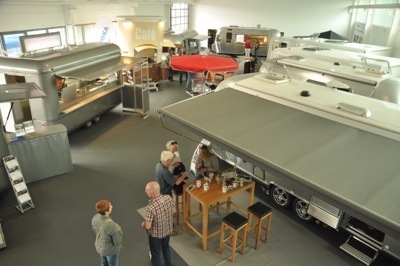 It’s out on an industrial estate off the main road, really in a fairly rural location that you wouldn’t expect to find an Airstream dealer, but they have a beautiful showroom and seem to do a good business in both Airstreams and custom mobile catering trailers. 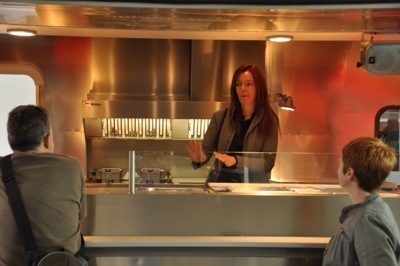 Eleanor took to one of the custom catering Airstreams that Airstream Germany (Roka-Werk AG) makes and began explaining exactly how it worked to Pete and Tracey. I think she’d like one for Christmas, but I can’t figure out how to get it in my checked baggage allowance at Lufthansa. We met up with our friends Koos and Stefan, from Holland, and went up to the Weilburg altenstadt (old town) to have lunch and tour the Schloss (castle). 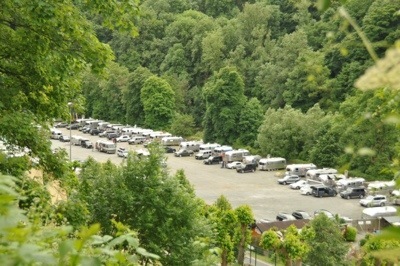 We had a remarkable private tour since nobody else was there at 3 p.m., and then got back to the encampment to find the total number of Airstreams had swelled just a little bit more. 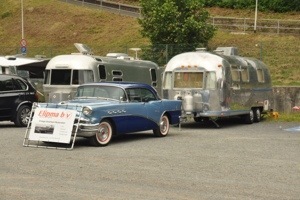 That’s when I wandered around to take these two photos of Buicks that towed in Airstreams for the event. These are posted on the blog in response to a request from a blog reader. At 6 p.m. the mayor of Weilburg came by to offer a little speech, but it was entirely in German, alas, so we didn’t understand it. Everything else at this event has been conducted in English, thanks to the bi-linguality of most Europeans, for which I am grateful. We are trying to use a little German here and there but we’ve been indebted to our friends who have helped out in translating things. After the barbecue I was supposed to speak at 9 p.m., but we’re quite a bit further north than I’m used to and we are getting close to Summer Solstice. So it was far too bright for the projector to be seen. We postponed my talk until about 9:40 (and it was still light out). When I finished talking about America’s National Parks at 10:15, the sun had finally set but it was still light enough to see clearly. I think the most invigorating aspect of the day has been all that I have learned about European camping, EU Airstreams, and the people. I feel like a newbie here. All of my preconceptions rooted in American experience are being challenged and expanded. It’s fun. They have a lot of good ideas here and I plan to bring a few back with me, along with the contact information of the new friends we have made. It’s a bit chilly out again tonight so the hydronic heat is on, and I have to say I love it. I’d seriously consider retrofitting this to the next Airstream I’m working on, but it does require a “clean slate” of flooring and room for the radiators in order to fit. Still, it’s just wonderful: silent, even, efficient. Well, that was all we could do for one day. We called Emma to say goodnight and now are back in our comfy Airstream looking forward to hitting the sack. Tomorrow we have a long scenic drive planned, so we’ll try to get an early start. I can only hope that tomorrow is as wonderful as today has been. Very cool to see you enjoying yourselves and alas, it is sometimes a good thing to speak another language or two. The Germans and the Austrians aren’t really known for their bilingualism, so having all the regular proceedings being conducted in English is quite something. Thank you for the Buick photos. a ’55 is one of my favorites. It was so great to meet you and Eleanor. Your talk and slideshow were fun and inspiring. I think we Brits all dream of scenery like that (our island is tiny really). 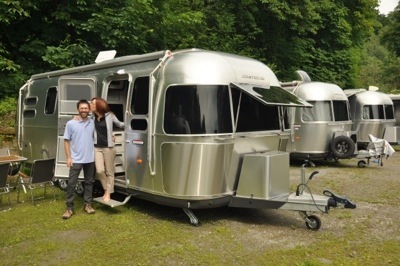 So pleased you liked our Euro Airstreams so much. They are clever aren’t they? !